Christened with a most unlikely and dare I say rather un-pretty name, Miner’s Lettuce may not sound like the most appetising of edibles. But if you were a miner during the California Gold Rush, the sight of these plants emerging from the soft soil would have been as welcome as a plethora of gold nuggets. The plant took its name from these miners, who consumed it to supplement their daily vitamin C intake and fight scurvy. This incredibly succulent, melt-in-your-mouth raw salad green has recently gained popularity in the gourmet greens world; attracting both world class organic growers and chefs. Best used fresh and tiny, these elegant leaves bring a rich, tart-creaminess to delicate, micro-green salads. 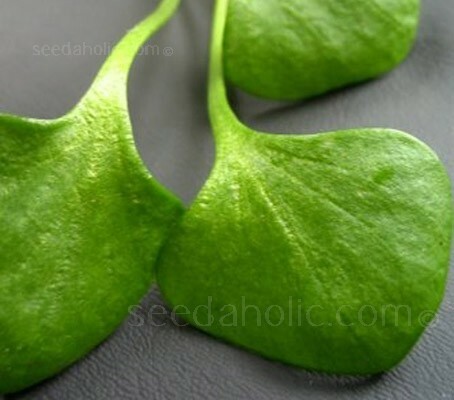 Larger leaves may be used a bed for grilled fish or tossed into stir-fries and pasta dishes at the last minute. It has a mild taste, so is excellent for tempering bitter salad greens like rocket (arugula) or endive. 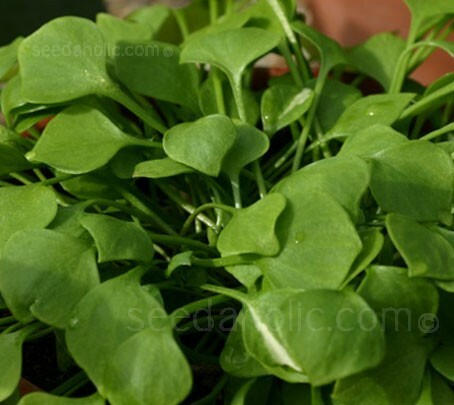 Claytonia even stands up to boiling or sautéing, so is an excellent for use in place of spinach. Miner’s lettuce is a godsend, it appears in the early spring, when you are hungry for something fresh, the winter crops are quite exhausted but the lettuces aren’t quite ready. Sowing: Sow Claytonia outside in August and September for an autumn/early winter crop, or sow under protection, from August to December and in March or April. Seeds can be sown in pots or directly into a prepared bed. Though the seeds are tiny, try to sow them sparsely so you don't have to thin them later. After sowing make sure you keep it well watered. The seed usually germinates rapidly. Claytonia will also thrive in partial sunlight. You might even plant it in the shade of a deciduous tree where other garden crops might languish. It will receive the sun it needs after the tree's leaves fall. Pull up the plants promptly when they start to set seed (they're easy to pull up). Otherwise, you will have a galaxy of plants the following year, and not necessarily where you want them. On the other hand, letting a few plants self-sow in the bed may prove a handy way to ensure a yearly supply of this elfin crop for your winter table. This great winter salad crop should give a continuous supply of leaves from October to May. Usually you will get 4 or 5 cuts through this period; the last couple of crops in the spring are the best, because they produce tiny white edible flowers through the centre of the leaf. Cut using scissors, but be careful to leave that little nubbin at the base intact. You might want to trim the stems a little. When left on the long side, the stems stick out your mouth, making for a potentially embarrassing meal when amongst certain guests. Try a fresh salad of claytonia, dried figs and shavings of Parmigiano cheese. A few handfuls dropped into a soup at the last minute will lend just a bit of thickness, the way sorrel would - one way to use the leaves if they have grown larger and firmer, as they may in mild-climate gardens. The plant develops a nodelike root that can be eaten and has a nutty flavour. The delicate blossoms also make a very pretty garnish. Although it never gets bitter and you can eat all of it at anytime, Claytonia can only be stored for a few days in the fridge since it tends to deteriorate quickly after harvest. Although only an annual, this species makes an excellent ground cover in a cool acid soil under trees. In such a position it usually self-sows freely and grows all year round. Winter Purslane is native to the Pacific Coast and Rocky Mountain states from Mexico northward to British Columbia (not Cuba, as Vilmorin claimed in1885). The genus Claytonia is named for John Clayton (1694-1773), Clerk to the County Court of Gloucester County, Virginia, USA from 1720 until his death. The species name is from the Latin perfoliata, meaning having leaves pierced by the stem, from Latin per meaning through, and foliata, meaning foliate, foliage or leaves. The vegetable received considerable attention during the days of the California gold rush, when it served as a cheap and readily available source of greens for the miners. Unfortunately, this name carried with it the implication of a rough-and-ready emergency food, not an elegant green for proper Victorian tables. This may have helped prejudice many Americans against it in the nineteenth century, especially since it was a common “weed.” Happily, it has recently undergone a revival of interest as part of a general shift toward exploring alternative ingredients. The Miners were not the only ones who appreciated miner’s lettuce. The American Indians not only ate it raw and cooked; they also made a tea from the plant, hence its other name: Indian lettuce. John Clayton was Clerk to the County Court of Gloucester County, Virginia, USA from 1720 until his death. He was one of the earliest collectors of plant specimens in that state, and is described as the greatest American botanist of his day. John Clayton conscientiously and systematically took samples of everything he encountered, and sent them to Mark Catesby at Oxford, who in turn sent them to Gronovius in Leiden, Holland, where they were examined by Linnaeus. He did not publish much himself but his specimens were of considerable taxonomic and nomenclatural significance, and Gronovius based his work at least in part on a manuscript by Clayton. Since his were some of the first North American specimens studied by Linnaeus, many were type specimens for Linnaean names. The specimens that were studied by Gronovius were bought by Sir Joseph Banks and subsequently passed to the British Museum (now the Natural History Museum) in London, where they have recently (1988-1990) been separated from the main collection and curated as the Clayton collection. The date of his birth has often been given as 1686 rather than 1694, but this is the date used by the John Clayton Herbarium of the Natural History Museum of London. It will grow in most soil types, asking only consistent moisture. or sow under protection, from August to December and in March or April.